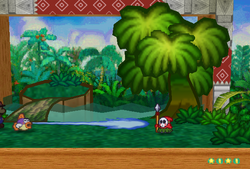 Squirt is one of Sushie's attacks in the game Paper Mario. The effect is that she shoots water at one enemy. All the player has to do to get the best effect is hold the button in order to fill the gauge; however, if the gauge fills completely, Sushie will overflow and the attack will do less damage. Thus, the player must hold and release accordingly to keep the gauge as full as possible without letting it reach the end. Squirt is an initial attack and costs three Flower Points. Squirt is especially effective against enemies that consist of fire (like the Lava Bubbles in Mt. Lavalava). It is best to use this move to fight Lava Piranha while he is on fire. This page was last edited on July 26, 2018, at 08:43.